ABSTRACT: Organic-cemented benthic agglutinated foraminifera are a highly dominant component of flysch-type DWAF assemblages, while agglutinated foraminifera that use calcareous cement are rare or almost absent. However, in mixed assemblages, consisting of both benthic and planktonic forms, the agglutinated foraminiferal assemblages usually include calcareous agglutinants and display higher taxonomic diversity than coeval flysch-type agglutinated foraminiferal assemblages. 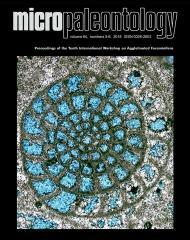 Late Paleocene - Late Eocene mixed foraminiferal assemblages from 45 samples collected from the Fore-Magura Thrust Sheet of the Polish Outer Carpathians, were examined for taxonomic identification of characteristic agglutinated foraminifera with calcareous material in their tests. The following 11 species are reported herein: Vulvulina eocaena Montagne, Plectina elongata Cushman and Bermudez, Gaudryina laevigata Franke, Gaudryina pyramidata Cushman, Arenobulimina d'orbignyi (Reuss), Remesella varians (Glaessner), Dorothia beloides Hillebrandt, Karreriella chapapotensis (Cole), Karreriella subglabra (Gumbel), Clavulinoides havanensis Cushman and Bermudez, Pseudoclavulina clavata (Cushman) and an additional 10 taxa are left in open nomenclature. The species assigned to Vulvulina, Plectina, Gaudryina and Pseudogaudryinella reveal calcareous material within their tests, though the descriptions of these genera do not always specify this feature. The results of this study reveal higher diversity and abundance of calcareous agglutinated foraminifera occurring in themarly deposits of the Fore-Magura Thrust Sheet in comparison with other units of the Polish Outer Carpathians. The studied group of agglutinated foraminifera with calcareous material may be regarded as a characteristic component of DWAF assemblages indicative of the slope marl foraminiferal assemblages.